Who says weddings have to start at a particular time? Sure, there’s traditional etiquette that dictates black tie and seated dinners, but why not have some fun and plan an alternative wedding time? If you’re looking for a way to make your special day unique, consider an alternative wedding time: breakfast, brunch, or late-night. This is especially helpful if your venue’s availability is limited or if you want to schedule your wedding on a Sunday or weekday. One tidbit of advice: while your wedding day is your special day, be considerate of your guests (especially younger and older family members), who may not be night owls. Whatever time you select for your big day, let it represent your style as the bride and groom. Personalized weddings are not only more fun, but much more memorable for you and your guests. You – and your entire wedding party – will have to wake up early. Read: E-A-R-L-Y. Morning ceremonies typically start around 9 a.m. or 10 a.m. Any later, and you’re having a brunch wedding. More on that later. Chances are, your pre-ceremony to-dos will be slightly rushed (there’s just so much to do), but that means more time for the reception! If your ceremony is outdoors, you’re almost guaranteed the most beautiful natural lighting (barring any unforeseen weather, in which case, we have tents!). And if you’re planning a summertime wedding, an early-morning ceremony means you’ll miss the noontime heat. Not everyone is ready for a heavy breakfast first thing in the morning, so consider fruit, light breakfast-y foods, and hors d’oeuvres like these French toast and maple syrup cups. If you and your groom are super fun and playful, opt for a cereal bar, complete with a variety of milks, cereals, and toppings. Coffee is always a good idea, but it’s an absolutely must for pre-noon weddings. 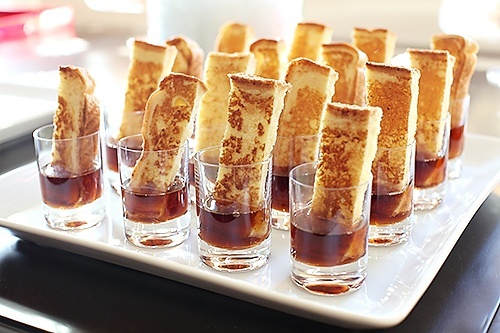 Offer Bailey’s as a creamer with an extra boost to get your guests relaxed and ready to mingle. An array of freshly-squeezed juices adds a nice touch to an early wedding reception. Break open some champagne, and voilà! Now you have a pretty, fruity mimosa bar! While most morning ceremonies are very mellow and relaxed, the reception is sure to be just as energetic as an evening wedding. After all, who doesn’t love an afternoon dance party?! The best part about a morning wedding? When you lovebirds leave, it’s still early-afternoon, so there’s plenty of time – and daylight – to be giddy newlyweds. Go enjoy the expensive hotel suite you booked for your wedding night! Not only will you have time for a truly romantic dinner with your new spouse, but your wedding hair and makeup will still be oh-so-lovely from your morning ceremony. Bonus points if you wind up in bed at a decent hour and wake up the next morning sans hangover. Brunch may just be our favorite meal of the day. If your closet is full of super cute brunch tees, then it’s probably your favorite meal, too! If that’s the case, opt for a brunch-time wedding. Seriously. It’s totally a thing. You’ll get to sleep in later than you would for a morning ceremony and you still get to enjoy the mimosa bar! Speaking of bars, let’s explore our options. BuzzFeed compiled a list of the Top 10 Beautiful Brunch Bars, and we are absolutely smitten! Spice up No. 10 with some Hattie B’s Hot Chicken for a touch of Nashville flair. Brunch is inherently casual, but dress it up with china and fresh blooms for a soft, romantic feel. This works for indoor and outdoor weddings. If you are planning an outdoor wedding, keep in mind that your ceremony and reception will take place during the hottest part of the day (sometime between 11 a.m. and 2 p.m.). Be sure to visit your venue during that timeframe so you can have an idea of lighting and temperature. Liven up your early-afternoon nuptials with some interactive games (think: croquet, corn hole, jumbo Jenga, and even mini golf) that will keep your guests entertained while the wedding party takes photos. Plus, it can also keep younger family members entertained because, let’s be real, kiddos get wiggly during weddings. The early-afternoon wrap time still applies to brunch-time weddings, which means the bride and groom will have a full evening to bask in their newlywed glow. If mornings aren’t your thing and a dinner reception is out of your budget, consider a late-night ceremony-and-reception combo. This your chance to be super whimsical and non-traditional. Maybe you offer cocktails to your guests upon arrival and invite them to toast your vow exchange. Invite a local food truck for quick, quirky menu options. Aim for an 8 or 9 o’clock start time, so older family members can head home after the reception. Guests will likely have had dinner, but they’ll definitely want some munchies. Go ahead and plan for a coffee bar to keep friends and family awake for the late-night dance party. Splurge on lighting – whether you love string lights for an outdoor ceremony, ornate chandeliers for a romantic reception, or swirling LEDs for the dance floor. We also recommend a shuttle service for guests to get safely back to the hotel. This is a nice amenity for all weddings, but especially one with a late-night (or very early-morning) end time.